Waffles have long been a favorite breakfast food for American households. Although many people think you need to venture down the road to a café or restaurant to enjoy an amazing waffle for breakfast. It’s actually quite simple to cook professional style waffles in your home. All you need is to find the best waffle maker and use our perfect batter recipe! That’s why we’re here at Waffle Makers Hub. In addition to giving you waffle recipes and other helpful advice, we want to help you find the best waffle iron for your kitchen. Below is a list of our top picks but you can also check out our blog for other in depth reviews to see what else we have tested and researched. Before we take a look at the best waffle makers, let’s just quickly go over what features we are looking at when we grade each machine. These are also good to review to see what is important to you and what functions fit your waffle making needs. Non-stick – we feel this is a necessity no matter which product you choose, so look for something like ceramic or Teflon to offer a non-stick surface. Not only will it produce better waffles, but it will be easier to wipe down afterward. Easy to clean – this again has partly to do with the surface, as a non-stick material will be easier to clean. However, look also look for drip trays and removable parts that can be easily cleaned. Thickness – the thickness can differ for each waffle maker so this will depend on how you like your waffles. A general rule is around 1 inch for Belgian waffles, however, there are many different varieties available. Timer function – some waffle makers will automatically turn off when ready, others can show you on a digital display exactly how much time is remaining while some have no timer at all. This all depends on how you prefer your appliances to function. Warranty – a minimum of 12 months warranty is recommended for any kitchen appliances, however, this shouldn’t be an issue when you stick to a reputable brand for your waffle maker. Heat control – some waffle makers offer the option of heat adjustment so you can cook them to your liking. If you prefer a darker waffle or something less cooked, this is a handy feature to have. 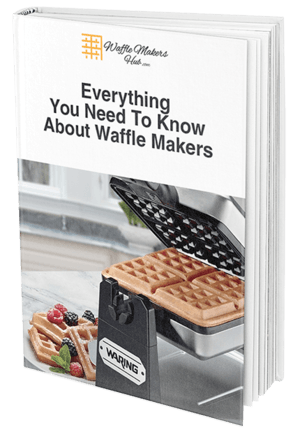 Capacity – while most standard waffle irons can cook one waffle at a time, some of the best waffle maker choices have a large capacity. That means either cooking two waffles at once, in the case of a double flip, or having a large surface area, in the case of a 4-slice waffle maker. Some devices can also cook other things on a grill or griddle, so this choice all depends on your needs. *Notice: On mobile phones, scroll right to see entire table. With its ability to make two large Belgian waffles at a time, temperature control with 6 different settings, non stick waffle iron plates and convenient indicator light to tell you when the waffles are ready, the Cuisinart Double Belgian Waffle Maker has it all. The only thing missing on this machine is a drip tray to catch batter run off but the way this waffle iron cooks makes up for that missing feature. While it is priced slightly higher than some other machines, this is the best waffle maker we reviewed. The extra cost is worth it, especially if you are trying to serve breakfast to more than one person at a time. Cuisinart is also a brand name that you can trust and is a company that makes kitchen appliances that last – you won’t have to buy another waffle maker for a long, long time if you invest in this one (if ever again)! If you love waffles and want a waffle maker that can keep up with your cooking, the Cuisinart Double Belgian Waffle Maker is the way to go! Creating perfect Belgian waffles isn’t a problem in this machine. In fact, the waffles were basically flawless and cooked to the ideal consistency every time in the Hamilton Beach Flip Belgian Waffle Maker. For under $50, this machine is a steal! Non stick plates, indicator light, drip tray… what more could you need?! We loved this single Belgian waffle maker and you will too. This also comes in a model with removable, dishwasher safe plates (although we don’t like that one quite as much). The Cons: Waffle maker feels slightly shaky, not quite as sturdy as the Cuisinart Double Belgian Waffle Maker. The Oster DuraCeramic Flip Waffle Maker, the Hamilton Beach 4 Slice and the Texas Shaped Waffle Maker are all amazing waffle makers as well and should all be checked out especially if you are looking for a bigger machine or one with a fun shape! The full reviews of each can be found under the ‘Review’ tab but keep reading to see which waffle makers ranked first in each specialized category. These products represent some of the best waffle maker models with all of the features necessary for the perfect waffle at a more affordable price. Even though they’re affordable for most family budgets, they can still achieve a convenient and delicious meal. The Oster DuraCeramic Flip Belgian Waffle Maker is an amazing machine at an incredible price. The chemical free non-stick plates work fantastically to make fluffy Belgian waffles that are picture worthy. The waffle makers durable construction is also something to note for a machine under $40- I doubt you will ever need to use that 12 month warranty that the Oster comes with! Perfect for a single person or a whole family, you should not hesitate to buy this waffle maker. Coming in at #2 for waffle irons under $40 the Krups 4 slice waffle maker can cook 4 waffle in under 5 minutes. Not only does this waffle maker have an indicator light, it also beeps to let you know when the waffles are done- a great feature for anyone who is multi tasking in the kitchen. This waffle maker is an unbelievable value for the price and is perfect for large families (or anyone who just wants to eat a lot of waffles!). It’s large size may deter some but the quality of the waffles makes up for the bulky machine! The Bella Rotating Waffle Maker is also a good option for the under $40 price range. It is quick to heat up, compact for small kitchens and also has deep Belgian waffle plates. The full review and video is on our site here! Although there are some great options available in the budget price range, often times people want a little more from their kitchen appliances. If you prefer to customize your cooking time, want an extra brown waffle, or need variety with what your waffle maker can offer, then spending a little extra can get you many of those features! These products all come in over the $40 range but even though they cost more, their value for money still remains. When looking at the best waffle maker 2017 contenders, it’s certainly worth it to spend a few extra dollars and get the amazing features that these products can offer. It’s no surprise that our #1 best waffle maker overall takes this category as well. We love this machine and it is definitely worth the price as it is durable, makes perfect Belgian waffles and has some great features to boot. Do you like having the ability to control the heat setting on your waffle maker? Well, the Cuisinart double flip can do that! Do you like to have the option to make two waffles at once? With the Cuisinart, you can make one or two big Belgian waffles at a time! Do you hate cleaning the tiny squares on a waffle maker? Just wipe off these non stick plates and you’re ready to go! The Cuisinart Double Flip Belgian Waffle Maker is the perfect machine for any waffle aficionado and would be a great gift for any waffle love in your life. With perfect waffles every time, this waffle maker will never let you down! Flipping ability to make thick and fluffy waffles- golden brown every time! The Cons: The only real downside to this waffle maker is the price. A simply amazing product in the mid-price range comes from Presto with their FlipSide Belgian Waffle Maker. This is another simple and straightforward waffle maker but with great features that will be attractive to the home cook with a small kitchen. The digital display on this shows you exactly how long your waffles have to cook, which can be handy if you’re busy in the kitchen. Great for multitasking, great Belgian waffles and a great price! While it is in a category all it’s own, the Texas Shaped Waffle Maker is a fun machine that makes perfectly golden waffles. For a little over $40, you can have breakfast in Texas everyday! While this is a tricky category to choose a clear winner as a different shape may appeal to different people, some shaped waffle makers we have tested are far superior than others. In fact, the winner of this category made better waffles than some ordinary waffle makers could manage! Anything that makes breakfast fun and delicious is a winner to me! The Texas Shaped Waffle Maker is the perfect kitchen appliance for any waffle loving Texan. The fact that it makes some of the best Belgian waffles we have ever seen is just icing on the cake. Just plug in this waffle maker and it quickly heats up and is ready for batter in a matter of minutes. The indicator light tells you when your waffles are ready and the non stick plates are very simple to clean. This waffle maker may have a fun shape but you can use it everyday as no one will ever get tired of a beautiful, fluffy, crispy waffle! Watch our video review below to learn more about the Texas shaped waffle maker waffle maker. If you’re a Disney fan, then this waffle maker is for you! While it does not make thick Belgian waffles, it does create a perfect Mickey Mouse face that is fun to eat and easy to whip up. Non stick plates, a fun design and golden brown waffles makes this our second place choice for shaped waffle makers. Kids and adults will love having Mickey for breakfast everyday! If you need to make a lot of waffles at once, then the best waffle maker for you may be a machine that makes four waffles in one shot. Great for big families (or big appetites), many of these are surprisingly easy to store. Here are our favorite 4 slice waffle makers of 2017. It is hard to believe that this compact waffle maker could produce so many beautiful Belgian waffles so quickly. The Hamilton Beach 4 Slice Belgian Waffle Maker heats up quickly, cooks the waffles to golden brown perfection, needs practically no cleaning and slips right into any small cabinet to be used at a later time. The fact that this machine is under $30 is just icing on the cake! An amazing waffle maker for an amazing price! A clear winner in the 4 slice category. With a temperature dial to control the heat setting on the non stick plates, a timer which beeps when the waffle maker is heated and the ability to make a large quantity of waffles is exactly what the Krups 4 Slice provides. While this machine was a little larger than the Hamilton Beach, it was still a great option for a 4 slice waffle maker. Makes 4 waffles in under 5 minutes! The Oster DuraCeramic 4 slice is a nice skinny machine with chemical free plates I’ve reviewed that works well. While the waffles were not evenly browned when we tested it, it is still a good option for the price. Flip waffle makers are known to make nice deep Belgian waffles that are golden brown on each side. Flipping the waffle at the start helps the batter spread evenly. If you like big restaurant style waffles, then these are the waffle makes you should check out. We have tested many and have found the best of the best! Coming in at #1 for the best waffle maker that you can flip (to spread the batter) is Presto FlipSide Belgian Waffle Maker. This is straightforward waffle maker that has a surprising amount of great features for the low cost. The digital display on this shows you exactly how long your waffles have to cook, which can be handy if you’re busy in the kitchen. The nice compact design is easy to store in a small kitchen and can be store upright or lying down. The thick Belgian waffles that the Presto Flipside makes are perfect every time- golden brown, slightly crispy but fluffy on the inside. The waffles pop right off of the on stick plates in just a few minutes and you can simply fold up the machine for next time. We love any waffle maker that is easy to use and makes perfect waffles just like the Presto! The Hamilton Beach Flip Belgian waffle maker cooks a mean waffle. With an indicator light on the top and bottom of the machine, you will know when your waffle is done cooking no matter how the waffle maker is placed. The convenient flip function cooks the Belgian waffle to a perfect golden brown on both sides for an even, photo worthy waffle. We love the dishwasher friendly drip tray and the non stick waffle iron plates but it really is the consistency of the waffle that puts this waffle maker in the number two spot. Crispy on the outside and fluffy on the inside, we can’t get enough of the Belgian waffles from the Hamilton Beach Flip Belgian Waffle Maker. The Bella Rotating waffle maker is a good choice for a flip Belgian waffle maker. It didn’t get the waffles quite crispy enough for our taste though which put it in third place on our list. All of the features and functions of various waffle makers can be confusing. Here are some answers to common questions you may have when choosing the best waffle maker for you! Let us know if you have any more questions about waffle makers and we will be happy to answer! 1.) What is the purpose of flipping a waffle? Flip waffle makers are very popular and most professional chefs prefer a flip waffle maker over a regular, non flip waffle maker. Why are they so great? Well, when you pour the batter into the waffle maker, it immediately settles into the bottom plates (thanks to gravity!). While the waffle batter should puff up as it cooks and make contact with the top waffle plates, that is not always the case. In a non-flip waffle maker, the bottom of the waffle may get very brown while the top of the waffle, if it is not fully touching the top plate, may stay pale and not crisp. With a flip waffle maker, the batter is poured onto the waffle iron, closed and then flipped over to make sure that the waffle batter touches the top plates as well. Flip waffle makers ensure that the top and the bottom of the waffle are cooked evenly. Thanks gravity for helping cook our waffles to perfection! 2.) What is the difference between non-stick coating and ceramic waffle plates? This is a great questions! Most waffle irons feature non-stick coating which traditionally is made from a chemical polytetrafluoroethylene (PTFE), most commonly known as Teflon. While PTFE is great to help prevent waffles from sticking to the waffle iron plates, some are concerned with health issues that may be associated with PTFE. Ceramic coating on waffle irons is marketed as a safer, non stick alternative. Waffle makers with ceramic plates claim to be more durable than those coated with a basic non-stick coating and will not peel or flake after excessive use (and we know you will want to use your waffle maker all the time!). Ceramic plates are also made with natural materials rather than man made chemicals. Both ceramic plated waffle irons and those with non-stick coating are great to prevent waffles from sticking to the plates. It is up to you to choose which version is best for you! 3.) How much batter should I put in a waffle maker? This is a tricky question as it will completely depend on your waffle iron and also the waffle recipe you are using. The best answer is to check your waffle maker manual as they will typically say how much batter to add. You can also check out our waffle maker reviews (videos and articles!) as we will let you know how much batter we used in each machine (using our awesome waffle batter recipe). Trial and error, although tedious, is probably the best way to determine how much batter to use. 4.) Even though my waffle iron is non stick, should I use cooking spray to help the waffles come out easily? No! If your waffle iron has any kind of non-stick coating, it is best to not use cooking spray. Cooking spray can build up on the waffle iron plates and actually get sticky, making the waffles harder to remove and the waffle iron difficult to clean. Stay away from non-stick sprays! If it’s too late, check out our guide to cleaning your waffle maker and get that machine clean. 5.) What is the difference between a regular waffle and a Belgian waffle? Belgian waffles differ from regular waffles in one key way- they have thicker, deeper squares. Belgian waffle makers have much bigger and deeper plates which create a crispier outside on the waffle while keeping the middle fluffy. The deep squares on the waffle iron also make waffles that have nice crevices for syrups and topping to flow into. Regular waffles tend to be thinner and chewier. If you like a waffle that is similar in texture to a pancake, then look for a regular, skinny waffle maker. If you like thick, crispy waffles, a Belgian waffle is for you! 6.) Can I clean a waffle maker in the sink? Some waffle makers have removable plates which can be easily taken off and washed in the dishwasher. If you like to make sure your waffle iron plates are super clean every time, a waffle maker with removable plates may be for you. But this isn’t necessary, as the best waffle maker we reviewed doesn’t have removable plates. 7. )How long does it take to cook waffles in a waffle maker? This completely depends on the waffle maker that you choose. While some waffle makes will perfectly cook your waffles in 3 minutes, others may take up to 6 minutes. In all of our waffle maker testing, we have never had a waffle maker take longer than 6 minutes to cook a waffle. (Don’t forget that each machine may take a few minutes to heat up before you can add the batter!) As a general rule, you should expect your waffle to take 4-5 minutes to cook. 8.) How do I turn a waffle maker off? Most waffle makers do not have an on/off switch. In order to ensure that your waffle maker is off, you should simply unplug it. Unlike a toaster or coffee maker, waffle makers are not appliances that you can leave on the counter, plugged in and ready to go. However, plugging it in when you are ready to cook is pretty easy! Once you’re done, unplug your waffle maker and you will never have to worry if it is still on. 9.) Can you take a waffle maker apart to clean it? Most waffle makers do not come apart however some do have removable plates. If a waffle maker has removable plates, it is usually clearly marked and advertised. If there is no indication that the waffle maker has removable plates, it is safe to assume that it is just one, solid machine. Don’t worry though, waffle makers are not tricky to clean! We have a full cleaning guide to help you as well- check it out here. 10.) Can I use pancake batter in a waffle maker? Waffle batter is a little bit different than pancake mix but don’t worry! We have a full blog on how to make waffle batter from pancake mix. Check it out here and you will soon be making nice, crispy waffles despite only having pancake mix! 11.) If my waffle maker breaks, what do I do? Even the best waffle makers usually only come with a standard 1 year warranty but it is best to check your waffle maker manual or look on the waffle maker brand website. If your waffle maker is still covered under warranty, call customer service and explain your problem. It should be as simple as packing it up and shipping it back and receiving a new waffle maker shortly after. If you are concerned about a waffle maker breaking before you make that final purchase, you may be interested in purchasing an extended warranty. Companies like Amazon frequently offer extended warranty programs for appliances like waffle makers. For a few extra dollars, you can rest assured that your waffle maker is covered for several years. If you are still wary of the longevity of an electric waffle maker, you may want to check out a stove top waffle maker that has no electrical parts to worry about! We have reviewed two different stove top waffle makers, a cast iron and cast aluminum version- take a look here!